Congresswoman Shirley Chisholm made history by running for president in 1972, becoming the first woman to win a non-binding presidential primary in New Jersey. She said: “I’ve always met more discrimination being a woman than being black…” and “The emotional, sexual, and psychological stereotyping of females begins when the doctor says: “It’s a girl.” Shirley Chisholm was a trailblazer who made it easier for Senators Harris, Warren, Gillibrand and Klobuchar to now run for President. The other trailblazer is Hillary Clinton, who won 22 binding primaries in 2008 and was the first woman to win the Democratic Party’s nomination in 2016 by nearly 4 million votes. She went on to win the popular vote by almost 3 million, yet “lost” the election. 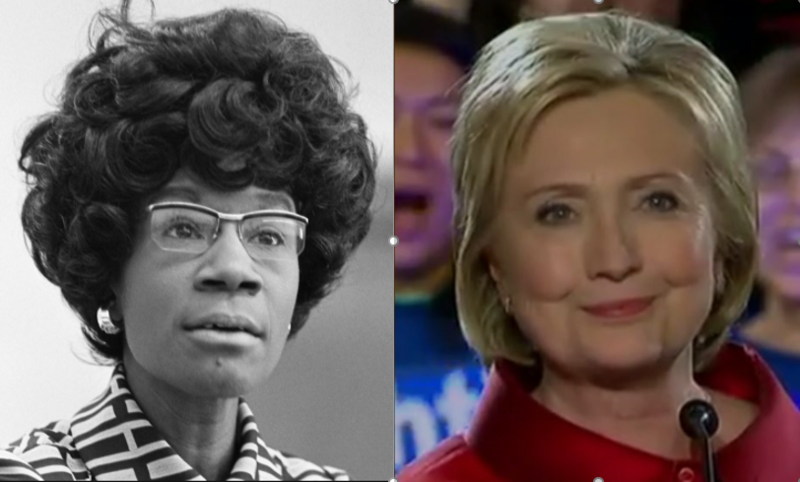 Hillary faced the grotesque stereotyping and bombast of which Ms. Chisholm spoke. Therefore, it is vital that those who run on her shoulders not repeat disses and slanders to curry favor with those who worked to defeat her by elevating their false, ego-satisfying talking points. Senator Elizabeth Warren angered the “Sandernistas” by endorsing Hillary Clinton in 2016. In order to win them back, a calculus I assume she made based on her intention to run in 2020, she later said that the primary was “rigged”. It was a cheap shot. Warren knows that is untrue. She said it anyway. It was a mistake. No, the campaign didn’t turn on Clinton making more appearances in Wisconsin. It was also a cheap shot and an unnecessary one made by an otherwise solid Senator who should know better. Corporate media ignored Hillary Clinton’s progressive policy prescriptions, instead thrashing her for 600+ days on nothing-burger emails. She was plagued by Vladimir Putin and his army of Russian bots, a rogue FBI director, a GOP smear campaign 25 years long and Independent Bernie Sanders giving Trump his negative campaign talking points, yet she was still able to win by 3 million votes. Klobuchar and Warren need to remember how many millions of women and men were appalled by the unjust treatment Hillary received and the hair shirt she was asked to wear, even for situations that had nothing to do with her, like rampant voter suppression in Wisconsin (and yes, she did campaign there). How much positive mileage do they think they are going to get with voter coalitions they desperately need to win a nomination, much less a general election, by dissing someone who has spent a lifetime working on behalf of the Democratic Party and for those in need. As has been noted elsewhere, Democrats didn’t win resoundingly in the 2018 midterms by going after Republicans – or die-hard Bernie Bros. They won by exciting, growing and turning out their base. I realize walking into a primary, we’re going to have to delineate policy differences and some sharp elbows will be thrown. But Hillary isn’t even running. It is crucial that we not diss those who came before us in any way. The male dominated media is going to seize on any opportunity to do what the male-dominated media always does with women: divide and conquer. It is a trap and I would strongly suggest that no woman candidate succumb to it. Kirsten Gillibrand is already being ridiculed for not knowing how to eat fried chicken—meaning she is an out of touch elitist. Klobuchar is the subject of a number of hit pieces for being mean to her staff. Warren is being dissed for claiming she has Native American ancestry. Kamala Harris, a former prosecutor, is criticized for being a “cop” a “corporate sellout” and “not black enough” for marrying a white man. Do you see where this is going? Who do you think is behind this material? Hillary Clinton stood alone to bear the onslaught for every quarter. These ladies better hope that since there are more of them, media doesn’t have time to focus on and destroy any one. But it is just as likely that the feeding frenzy will pick—and pick on—one at a time until, one by one, they are done. And certainly, as candidates be smart enough never to be baited into contributing to the pile on. I love this article! Fresh and always packed with juicy nuggets for the Vitamix of healthy campaign conversation! Wonderful piece. I am sharing in the Hope’s that women need the warning. I have a raging arguement on my FB page on this very issue. This couldn’t be more timely and RIGHT ON. Thank you! Thank you so much, Flora. Right on Sister! Let’s not divide to conquer! Another timely and important piece. The media, including women journalists and pundits continue to bash Secretary Clinton as they begin their misogynistic coverage of Warren, Harris, Klobuchar and Gillibrand. Reading that these candidates have also directed cheap shots at HRC is extremely disappointing. I hope they heed your wise words Anita. Thank you for your continued work on behalf of women everywhere! Excellent article and so timely! When I heard Klobuchar take that dig at Hillary, I did call her office and complained with passion about her dig at Hillary and warned them that millions of Hillary supporters have had enough of these cheap shots, especially when it comes from a woman. I reminded them that all of the women running were benefiting from what Hillary endured in 2008 and 2016 and should NEVER forget it. PLEASE e-mail this article to all of the women running. They need to read your article and remember, women need to have each other backs (like men always do for each other), NOT STAB THEM IN THE BACK.